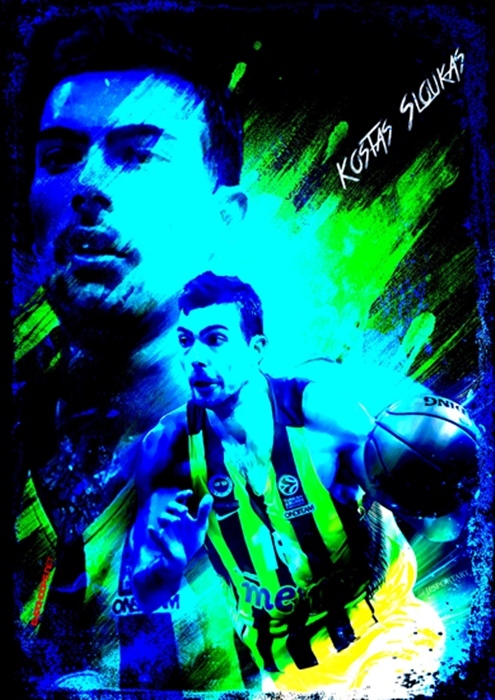 Kostas Sloukas returns in his official Blog in Eurohooops, writing about the series against Real Madrid, life in Istanbul and the… small “hill” he has to climb in his first season abroad with so many consecutive injuries! But what matters first and foremost in this highest level of professional spots, is the result and how the season will end. Fenerbahce needs only one victory in order to advance in its second consecutive Final Four and has “grabbed” the reigning champions by the neck. That probably helps the Greek guard to decrease the… pain he feels. So, in such a big turning point in Euroleague, everything falls to the right place for Kostas Sloukas. Truth be told, I have struggled a lot during the season. This is the first time in my professional career that I experience a situation like this one. Since November, I haven’t been able to train like I want to and in the way I am used to. Not even for one single week! My first injury happened on my shoulder. Few days later, and after I got over it, came the plantar fasciitis on my left foot. It bothered me, I was in pain, but I kept playing. We faced the whole thing conservatively. Ι didn’t train normally and I didn’t play in most of the games of the Turkish Basketball Super League. There was a period when I stayed out of any action for twelve days, but the pain remained. In the game against Cedevita I suffered a rupture on my foot, I cut it and stayed sidelined for 6 – 7 weeks. It was a first-time experience for me. Nothing like that ever happened in my previous years in Olympiacos. The most serious thing was when sometimes I stayed out of practices for one week. And even then, I still got crazy because of it. I felt weird and uncomfortable many times. This is my first year away from Greece and I wanted to play so much, I wanted to help, I tried to help, but I simply couldn’t. And that kept for a long time. It is very important for me that the Fenerbahce organization, as a whole, supported me so very much and helped me to handle the situation. The management, GM Maurizio Gherardini, coach Obradovic and his assistants, my teammates, the fans. Everyone. They helped me psychologically, they supported me in everything I needed to do and that increased my will and impatience to get better, enter the court again and help the team. The series against Real Madrid and the experience of a… 26-year old! The series with Real Madrid was – and remains – highly difficult. Nothing is guaranteed after two victories. We need three in order to advance to the Final Four. They are the Euroleague champions and the way we beat them in the second quarterfinal, has definitely hurt their ego. They are always very strong in Madrid. It wont be easy at all. Once again we must enter the match very focused and don’t let the game escape our control when it comes to rhythm and rebounding. But more importantly, what matters is to stay faithful to the coach’s plan. If we do that, we will win! If not, we will lose. It’s that simple. Covering for the absence of Jan Vesely is challenge for us, since he is a very important player for our game. And this is the moment when I should say a big “bravo” to Ekpe Udoh. He is an amazing player! He does every job there is on court, he is a wonderful character and puts his soul on the floor, during a period when we need him the most. Like the rest of my teammates, I want to go to Berlin so very much. I have already lived the whole experience in five Final Four tournaments. But, personally, I mostly take into account the three in which I had an active role in my team. I played in three Final Four tournaments with Olympiacos. We won two of them, but lost in the last year’s final in Madrid by Real. As I have said in my first Blog in Eurohoops, our roster is a raw diamond! Now, after the work that is being done by coach Obradovic and his assistants, we have built our chemistry. Our clear roles have played a big part in this. We can respond to many different basketball styles and in different squads, whether we play small-ball, or the tallest guys are in! We have proven it even now, without Vesely. Nikola Kalinic does a great job as a…. big guy, Antic is, as always, a main factor in big games. Luigi Datome is charismatic and can perform equally well in two different positions! We have lots of talent in our perimeter. Bogdan Bogdanovic makes some great things on the court in every aspect of the game, not only in scoring. Bobby Dixon is an exceptional team player. We all know Ricky Hickman’s worth, and there is also me, Melih Mahmutoglu and even Berk Ugurlu who might only be 20 years old, but he is a pretty good player. The coach’s ability to distinguish our roles, has made everyone understand them better and that plays a big part in our chemistry. Although there are so many qualitative players, he managed to take the maximum from all of them. The atmosphere in these two games in Ulker Arena has been amazing! The fans are so… thirsty! They dream that we will achieve something great in Euroleague. Let’s not forget that the club has never won the European championship. That provides us with extra energy and motivation. As in Olympiacos, the fans in Fenerbahce are a big part of the team. They live for the team, they get passionate and participate in an intense way to every success, or every failure, every joy or sorrow. I am very happy that I am back on the court again so I can help my team, but I still feel a bit of pain, and I am still not in the condition I’d like to be. Everything can happen in basketball. The only thing I can promise, speaking also for my teammates, is that we will “die” on court in order to bring Fenerbahce to the top. We need only one more victory. We don’t want to bring the series back in Turkey, but we all know well how difficult it will be to win in Madrid. We take it one step at a time. I hope that my next Blog will be about the challenge of a Final Four. That we will speak about the journey to Berlin and the semifinals. We have faith in ourselves, to the team and in the way our coach guides us! Take care, all of you. Kostas.